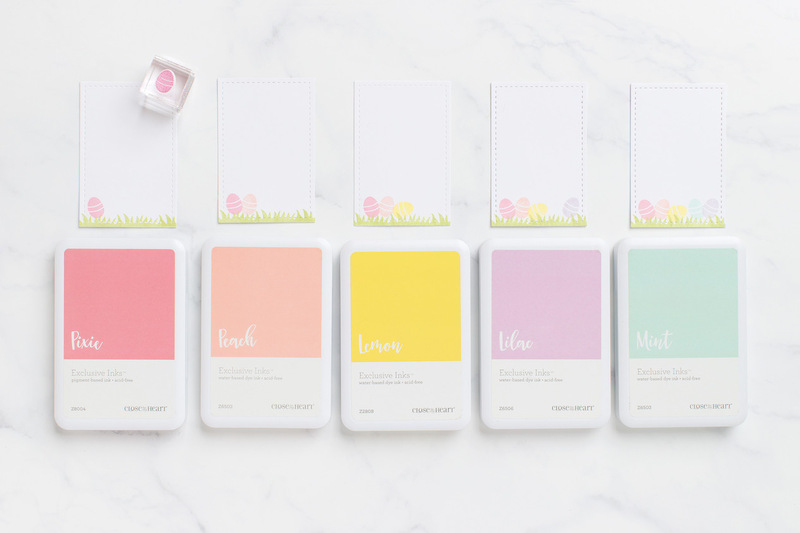 Back to the Basics with Cricut Design Space™—Card Edition! Often the tools we show you in Design Space are illustrated with a scrapbook page or layout, but not today! 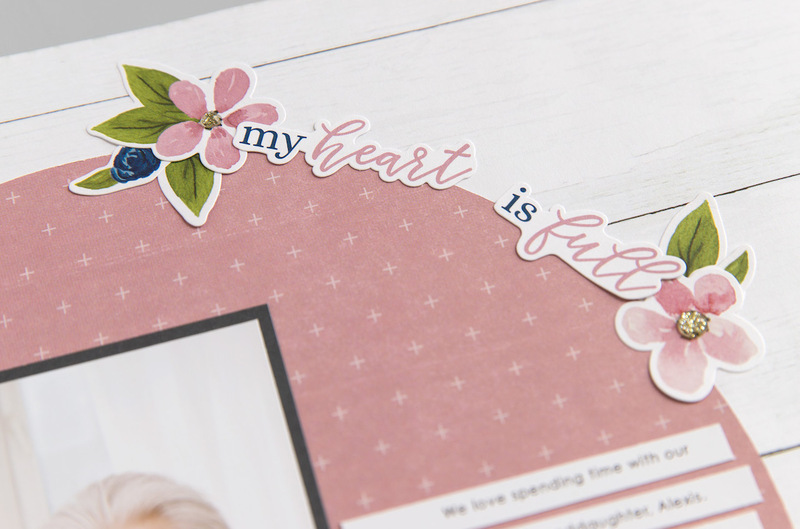 In this next back to the basics post, we want to remind you that these tools can be used for many, many projects, including custom cards and envelopes. 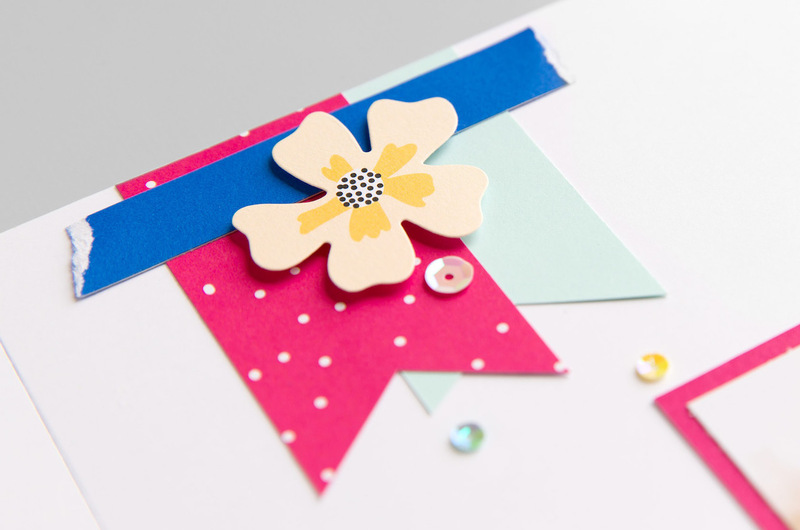 As we continue our review of basic tools in Design Space, you’ll see that it’s easy to create cards and envelopes that are both beautiful, unique, and most importantly, easy! 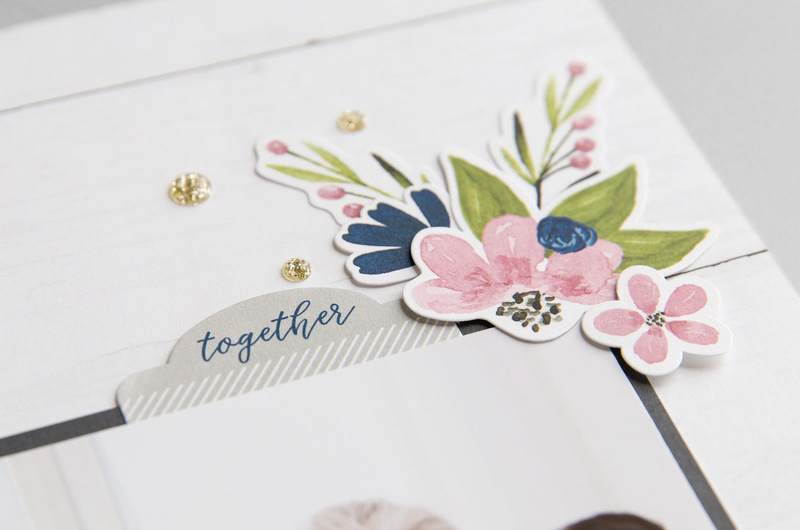 On the cards above, all of the shapes we used, including the sentiments, flowers, and even the envelopes, come from the Flower Market Cricut® collection. 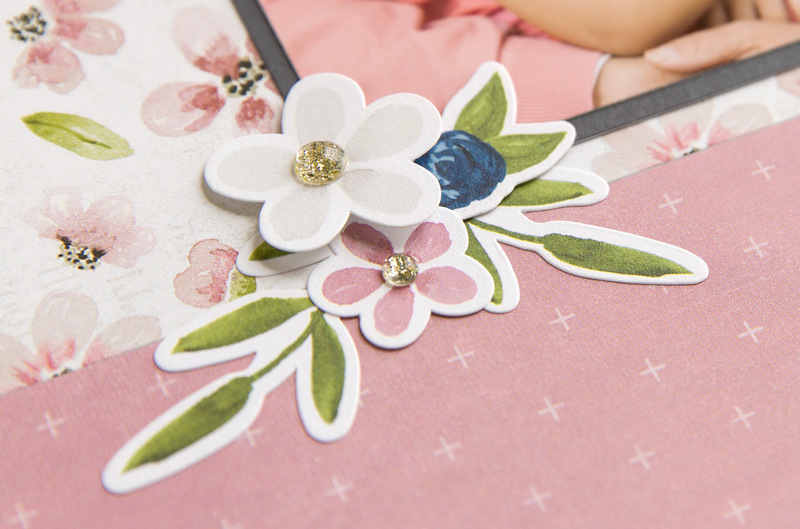 Flower Market has both flat and 3-D shapes, and you can see we’ve used both types on these cards. 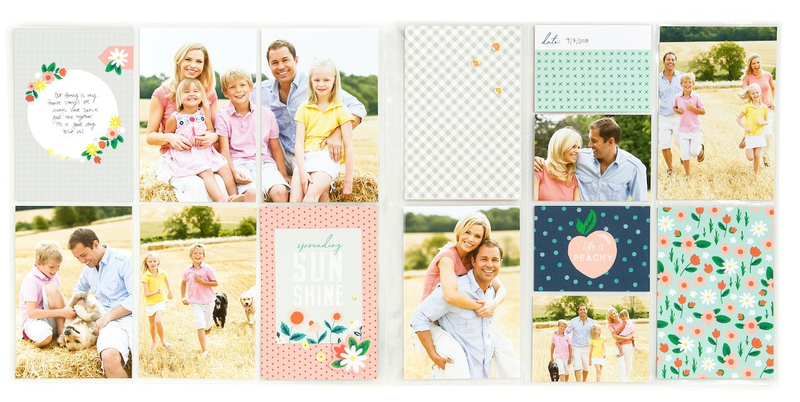 This makes it a truly versatile collection, useful for an entire year’s worth of seasons, celebrations, and creativity! Design Space has a “basic shapes” feature in the Design Panel. The shapes in this section are available to you for free, and it’s an easy way to add simple shapes like circles, rectangles, hearts, or diamonds and also use them as a base for other projects. 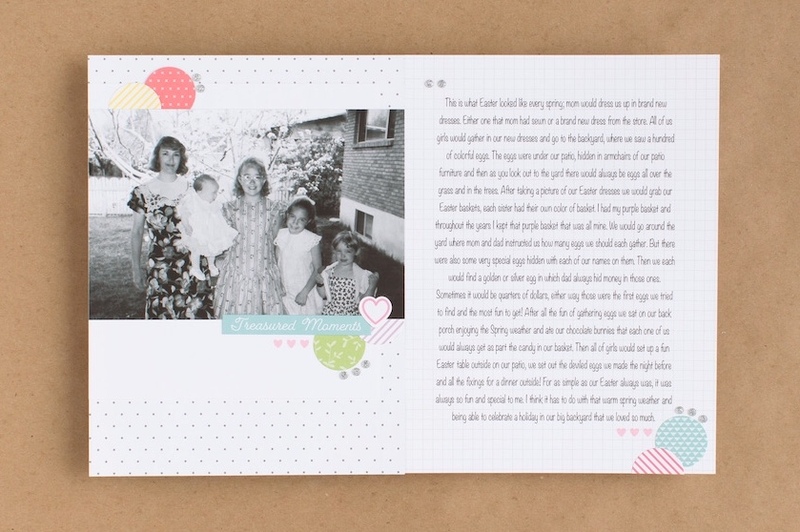 For example, you could insert a square and then size it for a variety of things, and this is exactly what we did to create our cards. 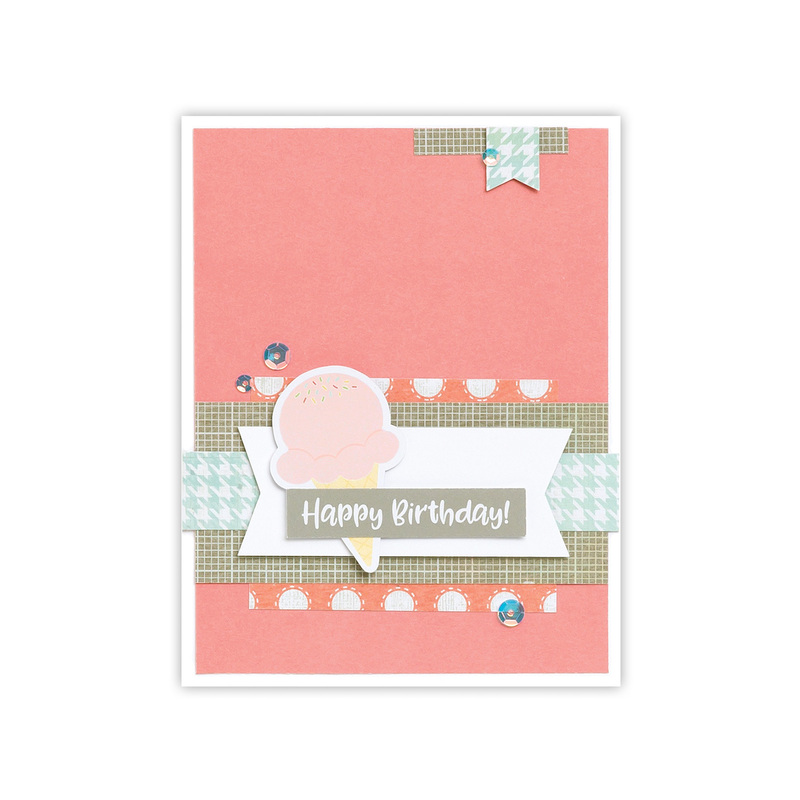 To create a card front in Design Space, insert a square shape from the Shapes section. Adjust the size to 4.25″ x 5.5″. 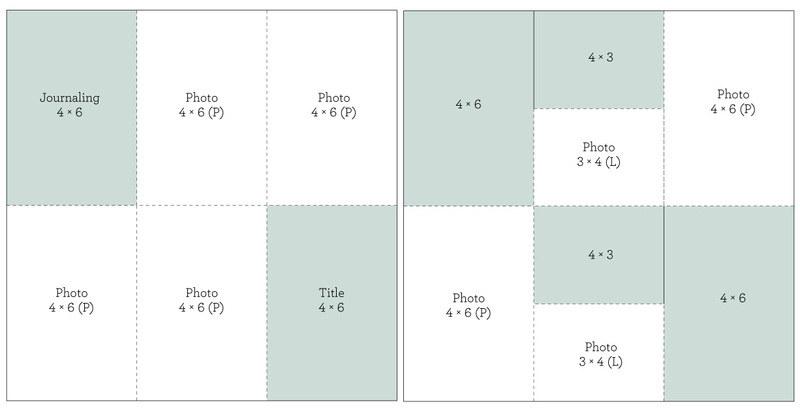 If you wanted to cut an entire card base, insert a square shape and size it to 8.5″ x 5.5″. In the next section, we’ll tell you how to add a score line to the card base. 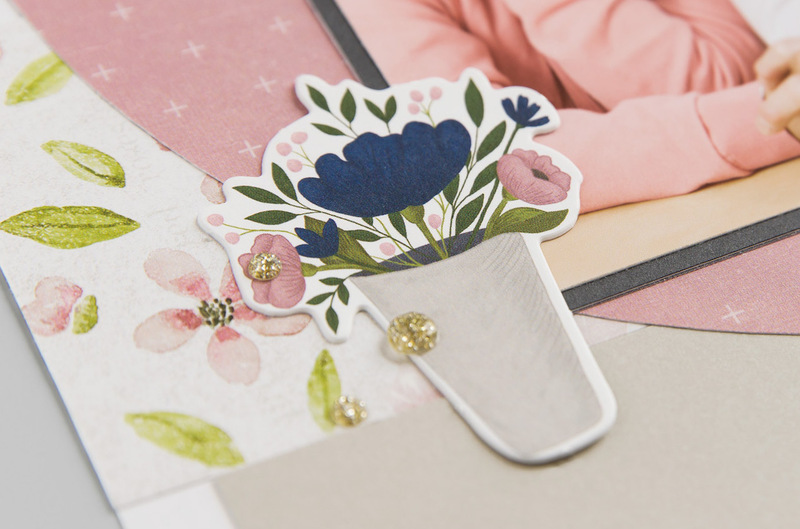 When you insert a shape on your canvas, the line of that shape is typically a solid cut line, but you’ll notice when you add an image, like the envelope from the Flower Market collection (#MD38C82), there is a dash line as well. This is a score line. 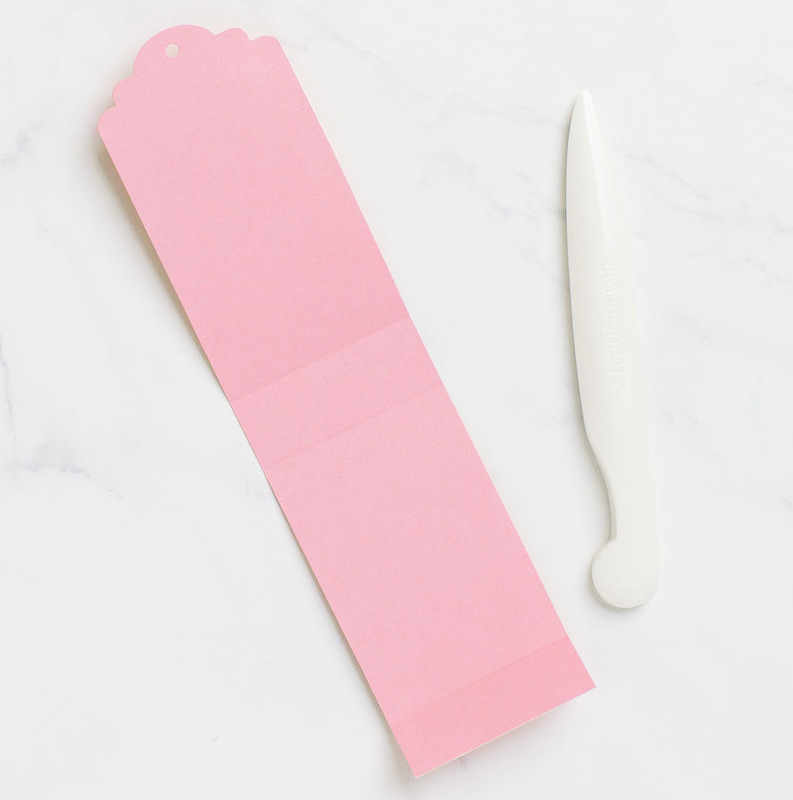 Your Cricut® machine will both cut and score the envelope for you. You just need a scoring tool or scoring wheel, depending on the type of machine you have. You can change lines to cut, score, or even draw. If you aren’t sure what type of lines you have on your shape. You can always look in the Layers panel. It will tell you which ones will score or cut, and you can change the line type in the Edit bar. To complete your card base, insert a score line. Score lines can also be added from the same Shapes section of the Design panel. Resize the score line to 5.5″, move it over your card base, and select both images. Then under Align in the Edit bar, select Center. Once the score line is centered, keeping both the line and the card base selected, click Attach in the Layers panel. Using Attach keeps your score line exactly where you want it, even if you move the shape on the canvas. We used the Slice tool to create the sentiments for our cards. The Slice tool is one of the functions at the bottom of the Layers Panel, next to others like Weld and Contour. With Slice, you can cut an image or text out of another shape. Simply place your word or image over the one you want to cut it from. Select both shapes, and click Slice in the Layers Panel. Initially, it might not look like anything happened, but if you click on your images, you’ll have two of whatever you cut. One is the shape itself, and the other is the shape you cut from the background. There are a few important things to keep in mind. 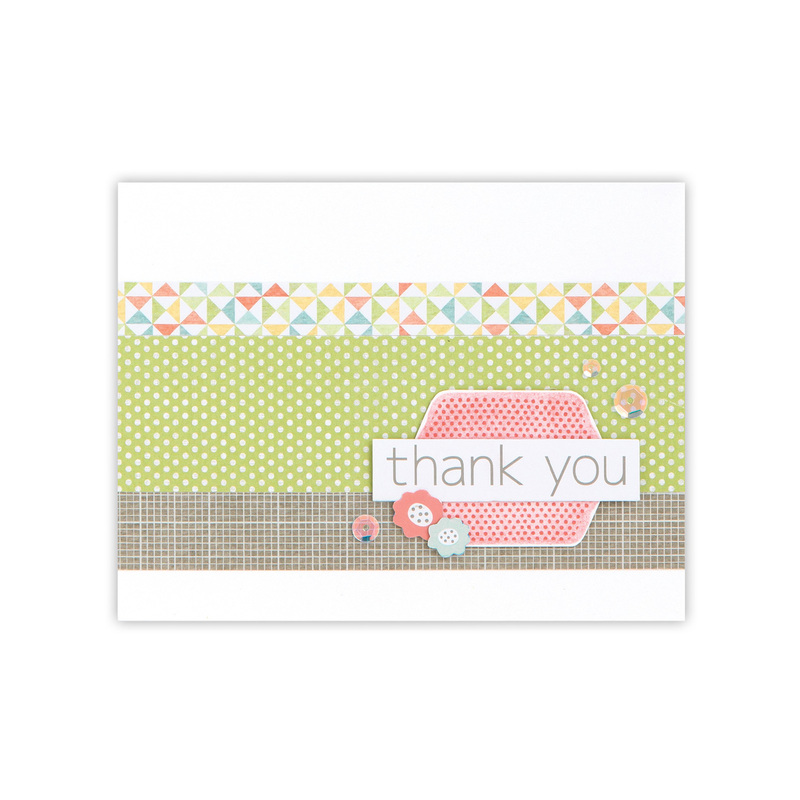 First, you can see in the “Thanks a Bunch” banner on this card, we sliced the sentiment from Lagoon paper and attached that to a solid White Daisy banner. For something like this, before you slice in Design Space, make sure you ungroup the image. Images that have multiple layers can’t be sliced. 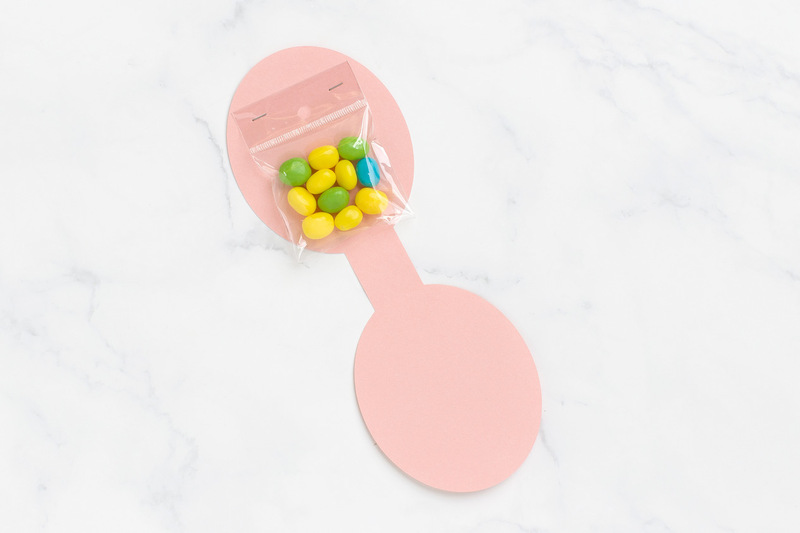 If your sentiment image has multiple pieces grouped together as one shape, like this one does, you’ll need to ungroup them and slice using just one image. Another thing to remember is to duplicate the solid shape that goes behind whatever you’re slicing, if applicable. 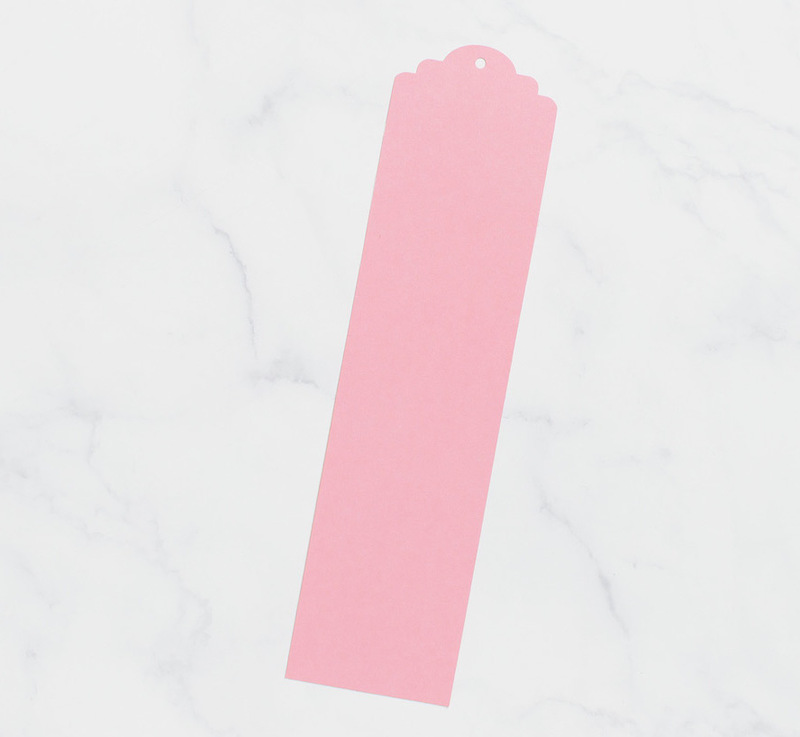 If you are slicing into the card base, you wouldn’t need a duplicate piece, but if you’re slicing into another shape, like the banner on this card, you’ll want to have a solid shape to layer behind it. 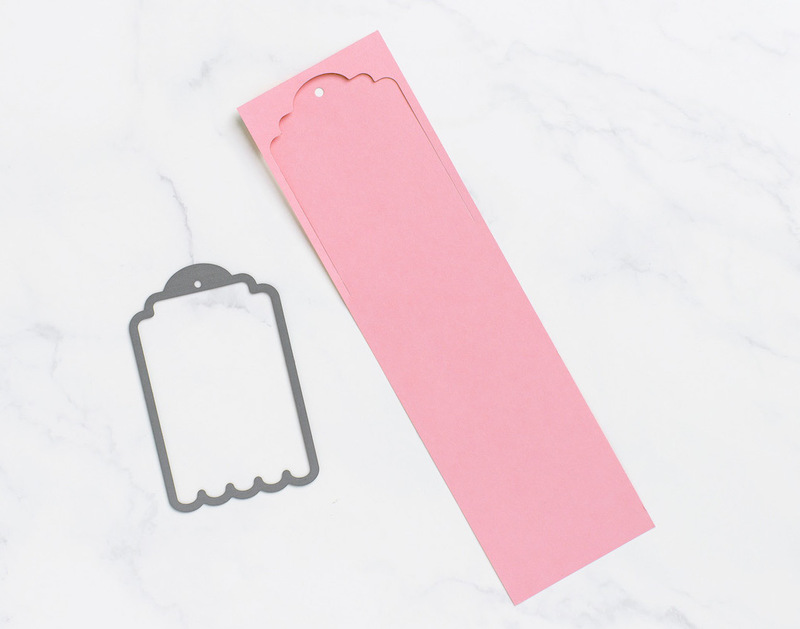 The last important tip we have for you is that you want to make sure when cutting your project that you keep small pieces that go inside letters or other shapes. 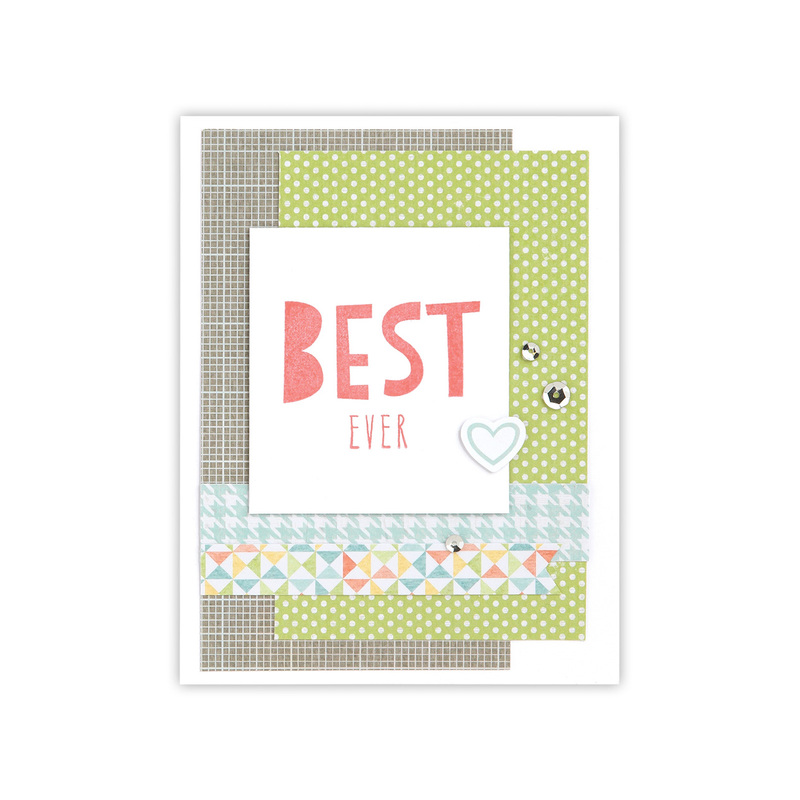 With this card, that means you want to set aside the inside of each “a” and the “B” to attach to the banner. If you look closely, you’ll notice a similar thing happening on the Happy Easter card, but it’s also a little bit different. 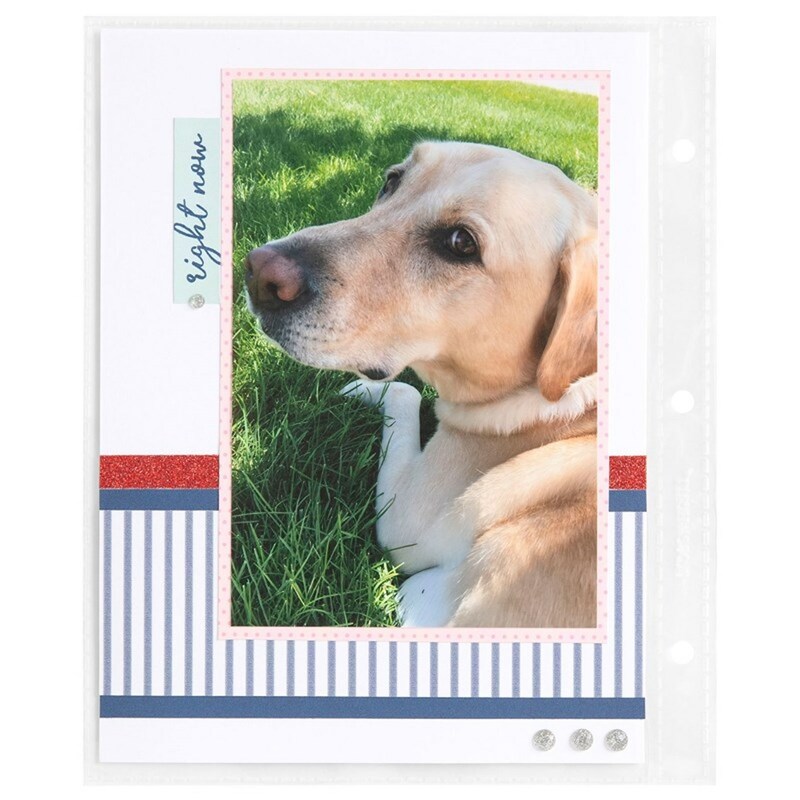 We sliced the sentiment from the card base, but instead of saving the inside pieces, we cut the sentiment separately and layered a solid piece of White Daisy cardstock on the back, behind the sliced shape. 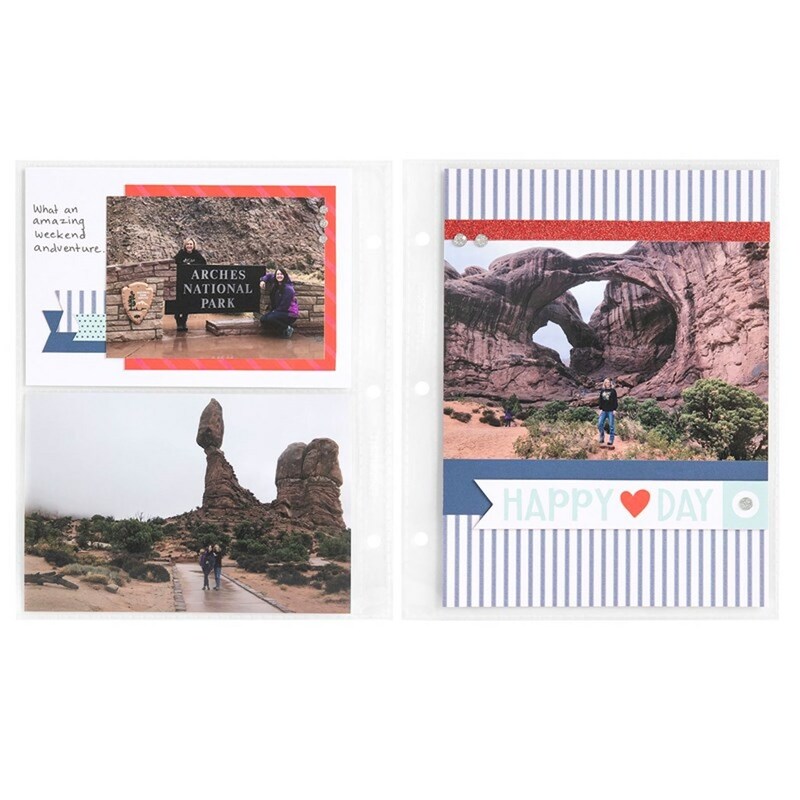 All of the cards in our post today use the tools we’ve talked about including a basic rectangle shape, inserting a score line, and slicing a sentiment. 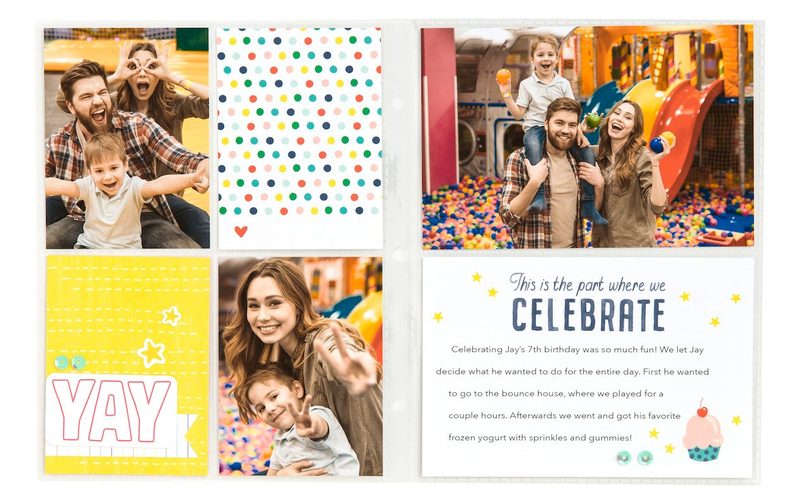 Follow the steps below to put it all together and make the Sending Sunshine card! First, search for the sentiment, #MD38CC3, and insert it on your canvas. Ungroup the sentiment, and delete only the “Sunshine” image. Then resize the sentiment to a height of 1.75″, leaving the width locked. For the card base, insert a square shape from the Shapes. Adjust the size to 8.5″ x 5.5″. Don’t insert a score line yet. You have to use the slice tool first, before attaching a score line. Slice the sentiment from right side of the card base. This is your card front. Place the sentiment where you want it, select both images, and click Slice in the Layers panel. Keep both extra sentiments. You’ll cut them from Lemon cardstock and layer the two in another step. Now insert a score line, also from the Shapes section of the Design Panel. Size it to 5.5″. Place it over the card base, and select both images. Then, under Align in the Edit bar, select Center, and then select Attach in the Layers panel. Insert other flowers and leaves on the canvas as desired. For our card, we used the Daisy image (#MFADCF2) cut in three different sizes, and we paired it with the Rhododendron leaf (#MD37FB). 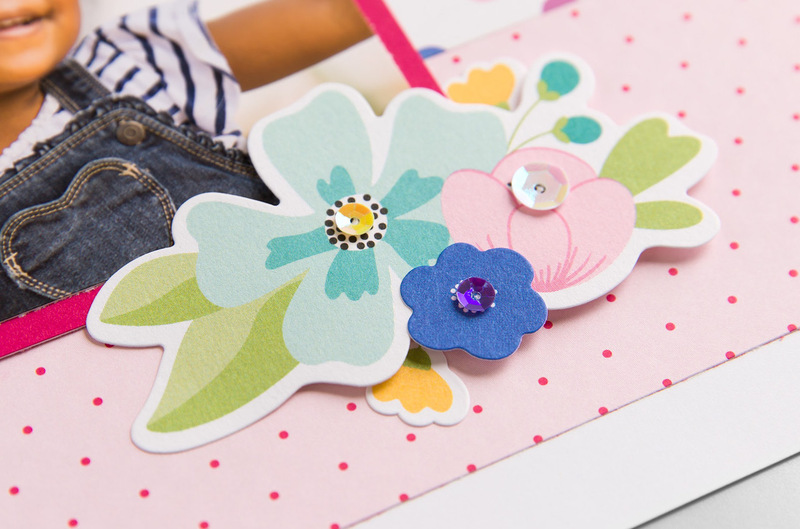 Color your project pieces to make it easy to cut on the right color of paper or cardstock. Then select Make It in the top right corner and cut your project pieces. 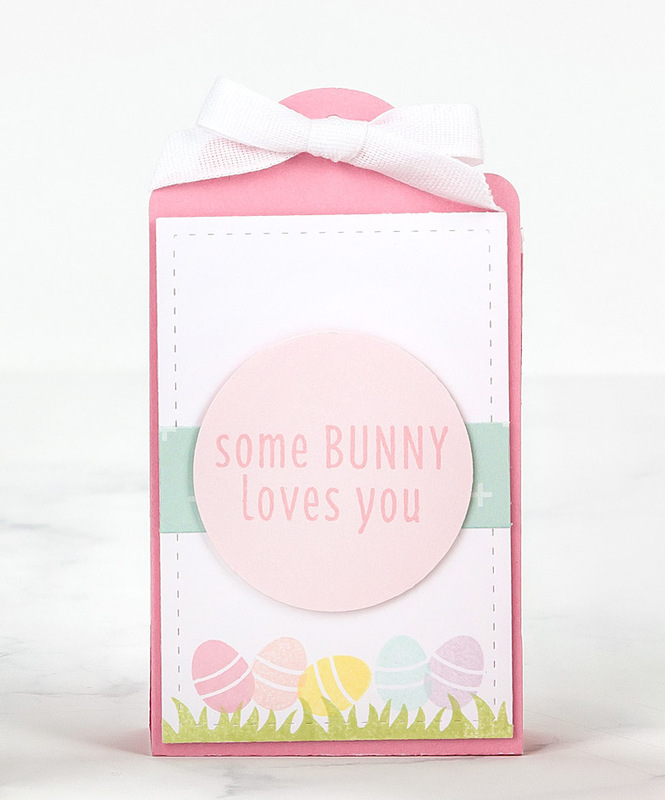 Attach one 4″ x 5¼” piece of Mint cardstock behind the sliced portion of your card (on the inside of the card). Then layer the two Lemon sentiments and attach inside the sliced section. 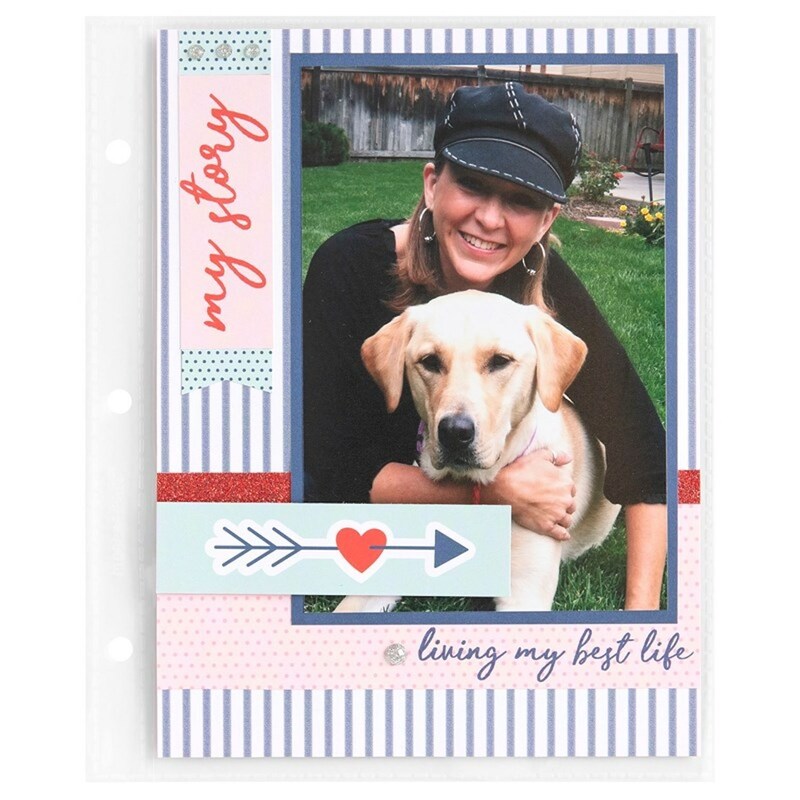 Embellish with stamped images, 3-D flowers, sequins, and more! 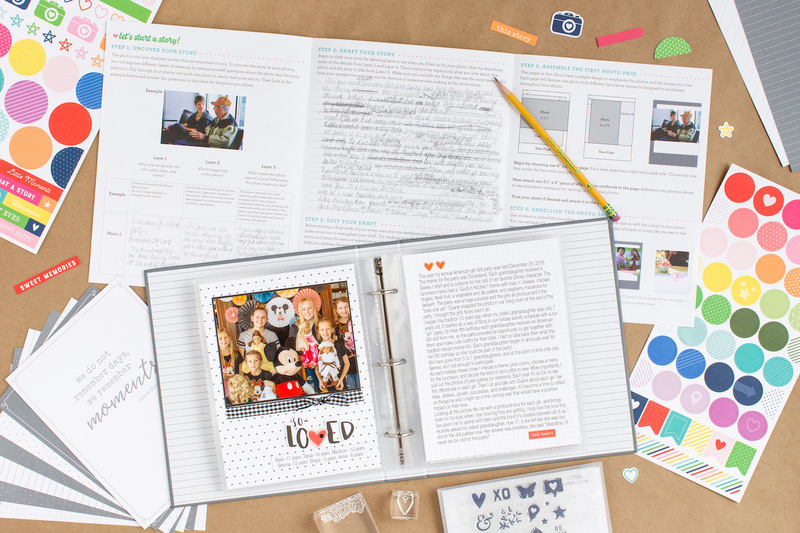 Are you unsure how to add a Close To My Heart digital collection to your Cricut® account? 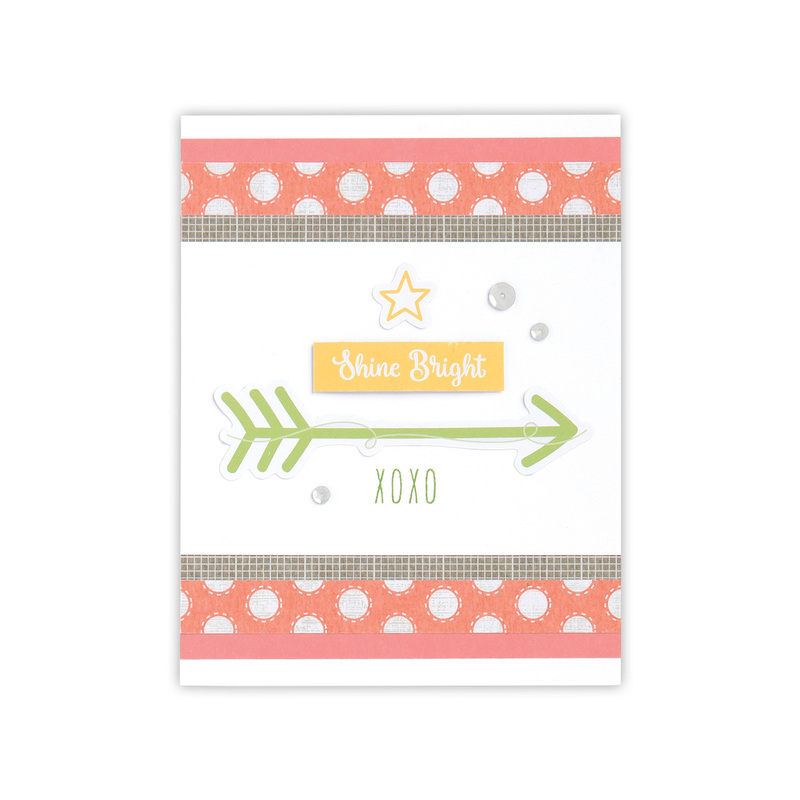 Simply visit www.cricut.com/CTMH and sign in to your account (or create one if you haven’t already). In the list of options in the menu on the left, you’ll see the last one is Redeem Promotion. Select that option. Then enter the code, click Redeem, and you’ll be on your way. Not sure if you’ve already linked your physical cartridges? In that same menu, you can select Linked Cartridges. This will show you the ones you’ve already linked to your account. Next month, we’ll look at ways to manipulate text in the Edit bar on the canvas with the shapes and unique font from the You Are Here collection. Check back in April for more Design Space fun! 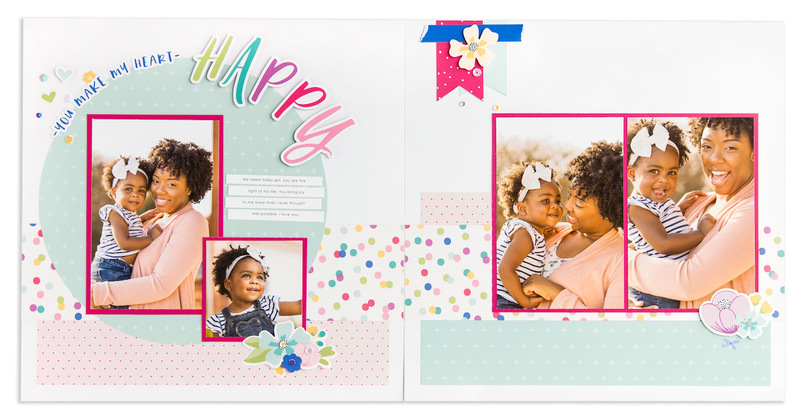 It’s Paper Party Time with a Free Scrapbooking Pattern! So glad you are joining us today because we are having a paper party All. Month. Long. What does that mean? It means that this is the time to stock up on your favorite patterned papers and coordinating cardstocks because they are all on sale! 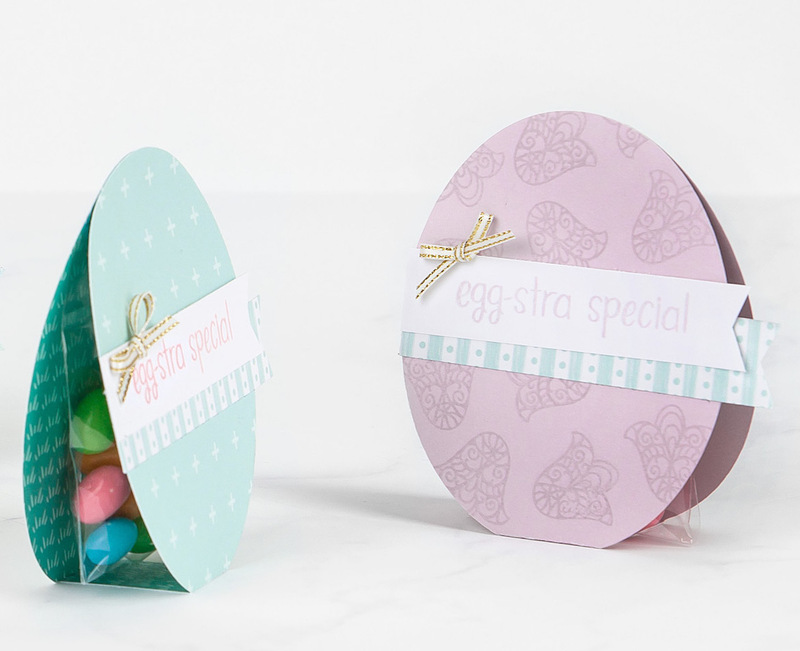 When you buy any one of our patterned paper packets or coordinating cardstock packs you can get a second one, of equal or lesser value, at 50% off! The best part, you can mix and match your packets to get exactly what you want. Visit our website, here, for a closer look at our beautiful papers and to get additional details on this party worthy event! 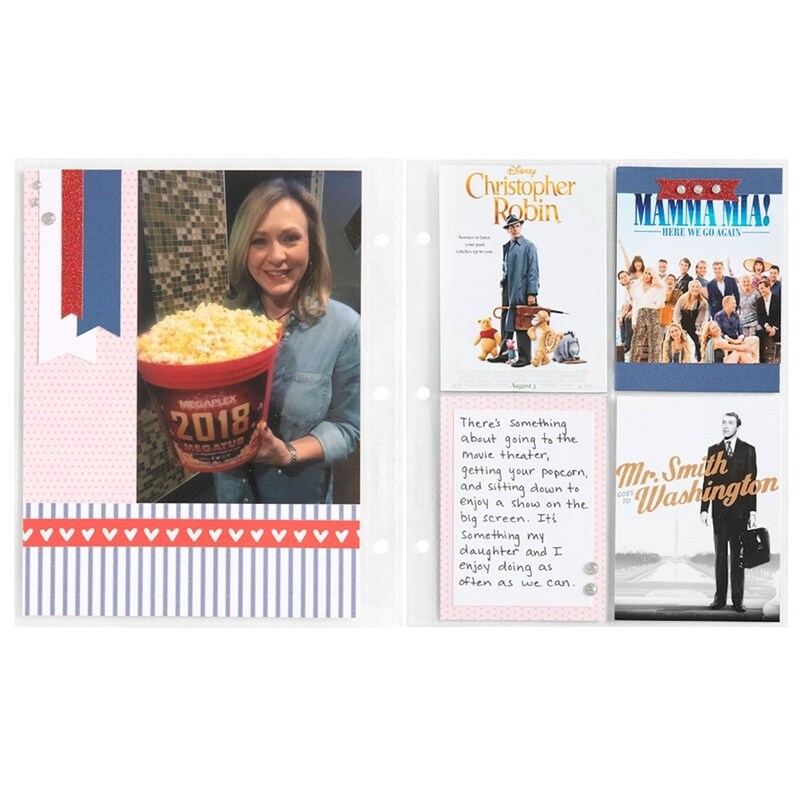 As a party favor, we are giving you a free scrapbook pattern for you to download and take home with you! 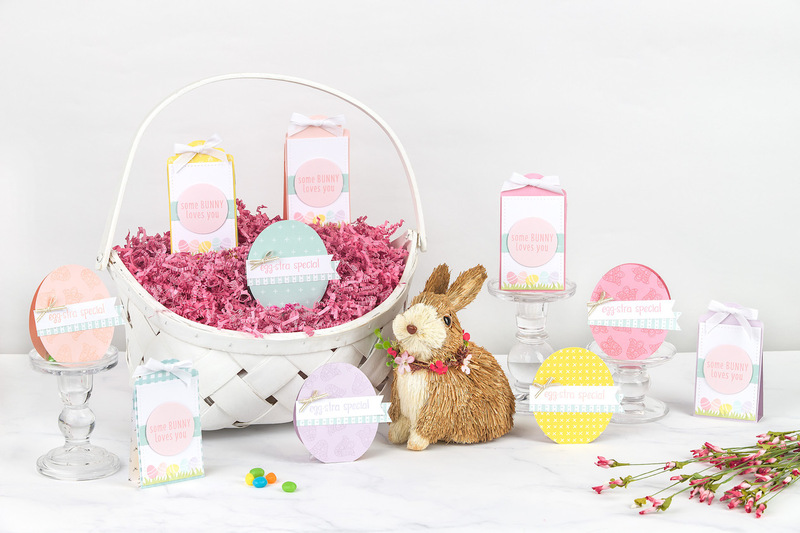 This pattern originally debuted with our Roxie paper collection, but, as you can see, we updated the instructions so they can be used with any papers and for any occasion. Above, we paired this timeless pattern with the I Heart Us paper packet and coordinating cardstock, and below we paired it with the Feels Like Home paper packet and coordinating cardstock. 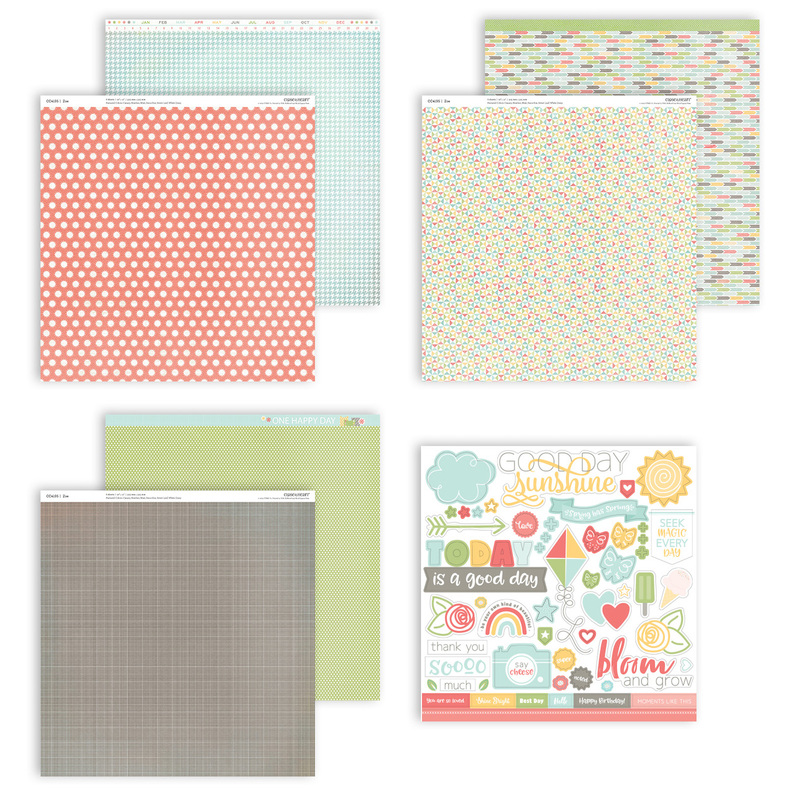 With our pattern papers and cardstock, you can achieve effortless color coordination in all of your crafting. 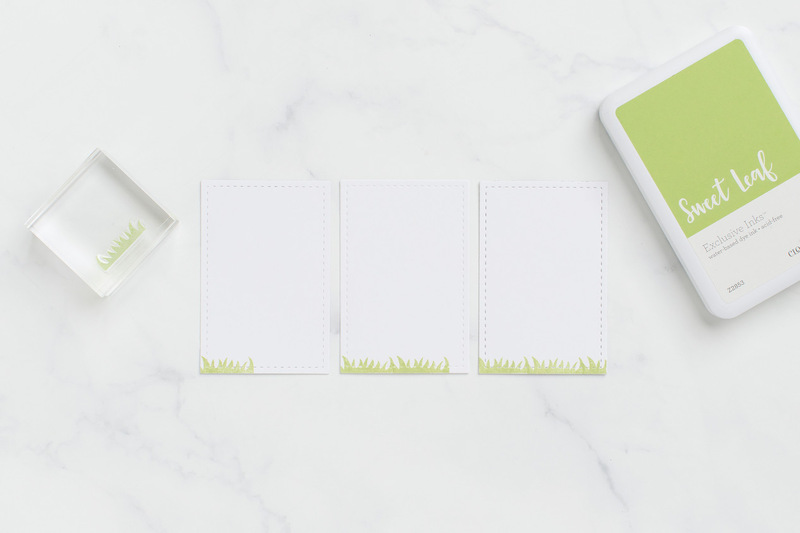 The patterns featured in each paper collections are designed using the same exclusive color palette as our two-toned cardstock, ensuring that each paper element in your projects comes together for a flawless match. 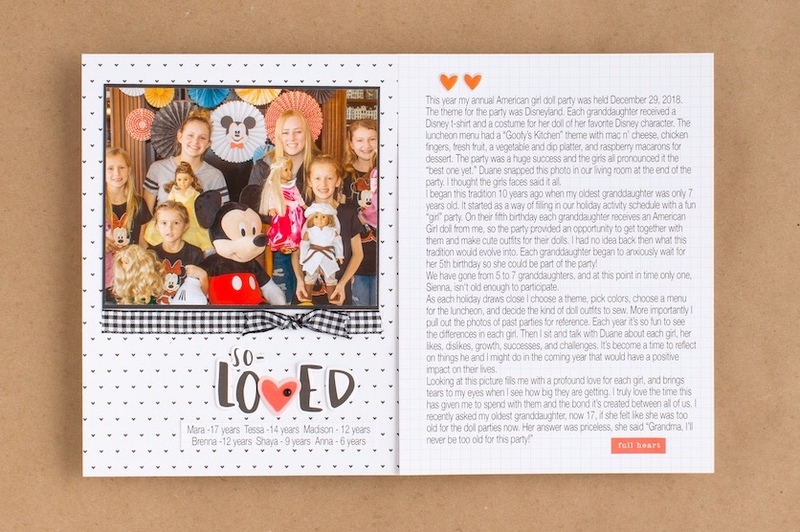 We take pride in providing the most comprehensive patterns for scrapbook layouts. When you download this pattern, you will notice that it also comes with cutting diagrams to make it even easier to create these pages! 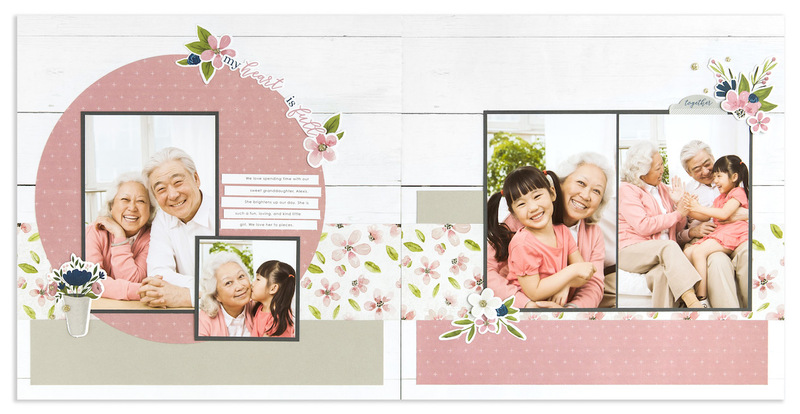 Download this free scrapbooking pattern, and have yourself a paper scrappin’ party! 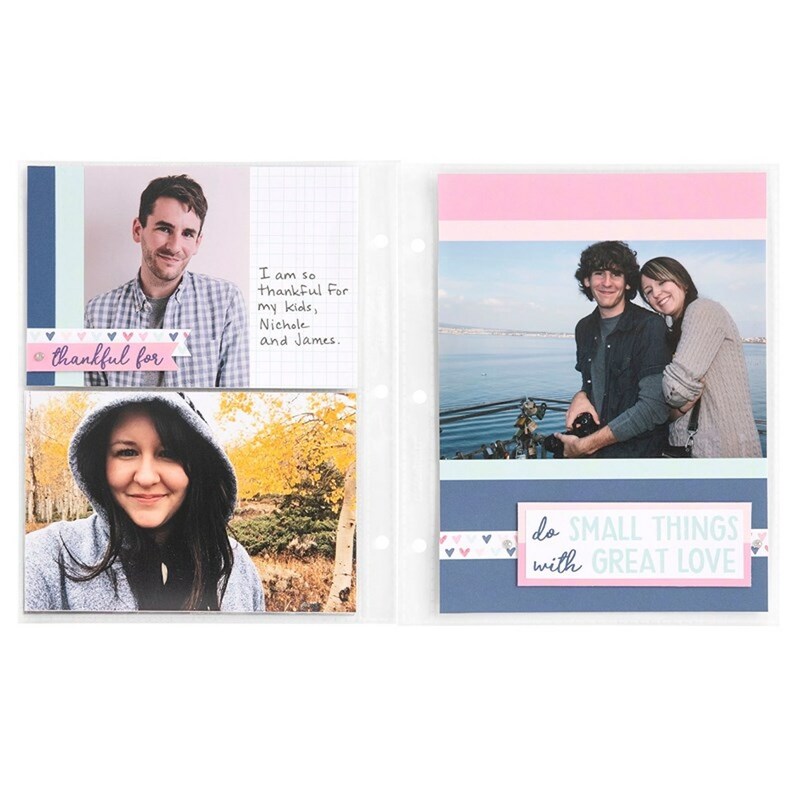 For even more scrapbook patterns, check out our Make It from Your Heart™ pattern books. If you love the free patterns on the blog, you’re sure to be blown away by all the patterns in our how-to books! No matter your comfort level with Cricut Design Space™, it’s good for everyone to revisit the basics. 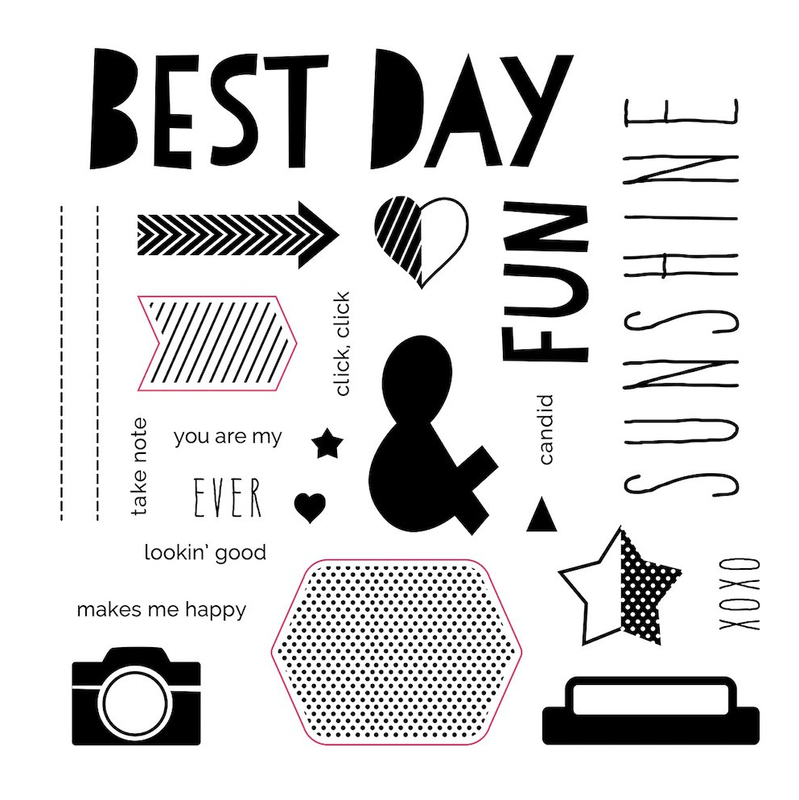 Today, and in a few more blog posts in the upcoming months, we’re going to explain some of the basic tools in Design Space and then illustrate how to use these tools with images from each Close To My Heart Cricut® collection. Making sure you have the basics down will only increase your confidence as a Design Space user, unlocking so many creative options for your crafting! 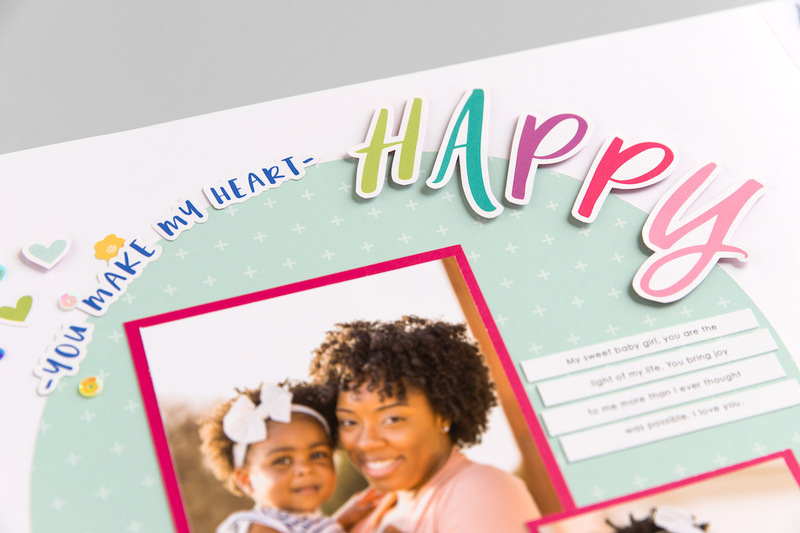 On the page above, we’ve used a banner from the Artistry Cricut® collection to create the title piece. Artistry has a wide variety of words and shapes including titles, sentiments, backgrounds, borders, and banners that you can use for any project theme. 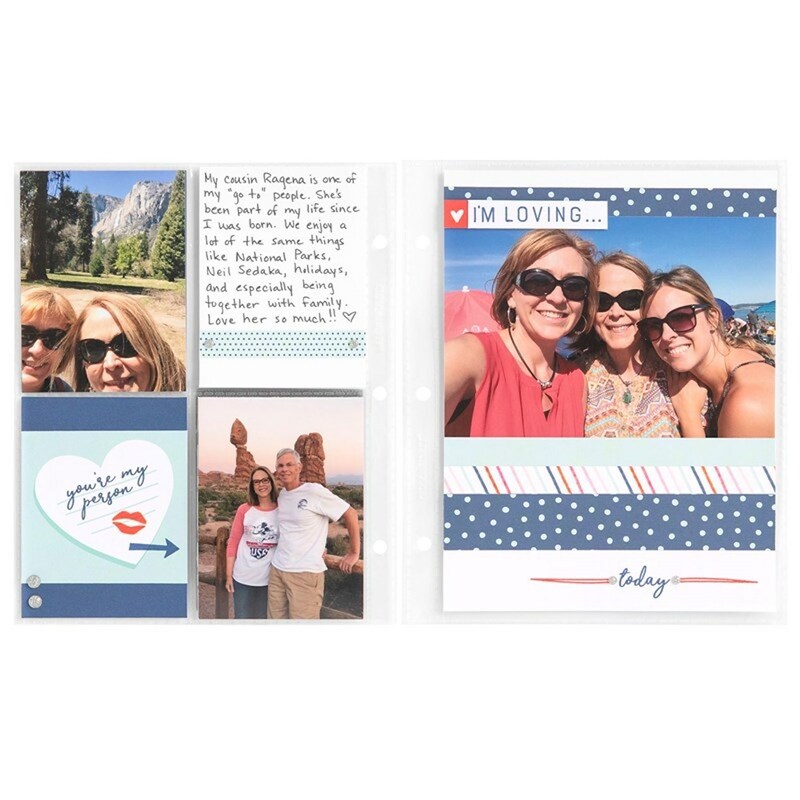 Whether you are celebrating a birthday or holiday, or scrapbooking everyday moments, you have lots of choices with this collection, and even more when using the tools in Design Space. As you read along, remember that the steps below show you how to work in Design Space from a desktop or laptop computer. If you use the app on a mobile device, the buttons and tools will be located in slightly different places on your screen, but the same features are available on any device. Let’s get started by taking a look at the project canvas. Whether you are new to Design Space or a seasoned pro, it’s useful to identify the different parts of the canvas and where to find particular functions and tools. Design Panel: This panel, on the left side of the canvas, is where you add new elements to your project like basic shapes, images, text, and more. Edit Bar: Below the Header, you’ll see the Edit bar. This section of the canvas houses many of the tools you’ll need to manipulate specific shapes and text. Here you can find tools like Linetype, Size, and Rotate. There are also options to Align and Arrange shapes, and most importantly, the top left corner is where you’ll find Undo and Redo, just in case you make a mistake. When you are working with text, more tools for adjusting the text will appear in the Edit bar. Layers Panel: The Layers panel holds tools that you might need when working with multiple images together. Tools like Group, UnGroup, and Duplicate are at the top of this panel. These tools let you copy, combine, or separate images. The Slice, Weld, Attach, and Contour features are at the bottom of the Layers panel. 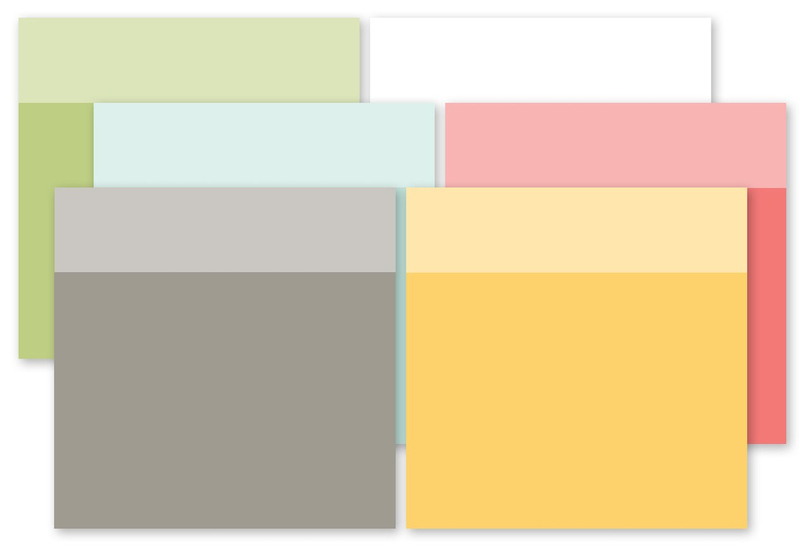 Color Sync Panel: The Color Sync panel and the Layers panel share the same space on the canvas. To see this panel, click Color Sync, instead of Layers. This allows you to match colors used in your project’s shapes. 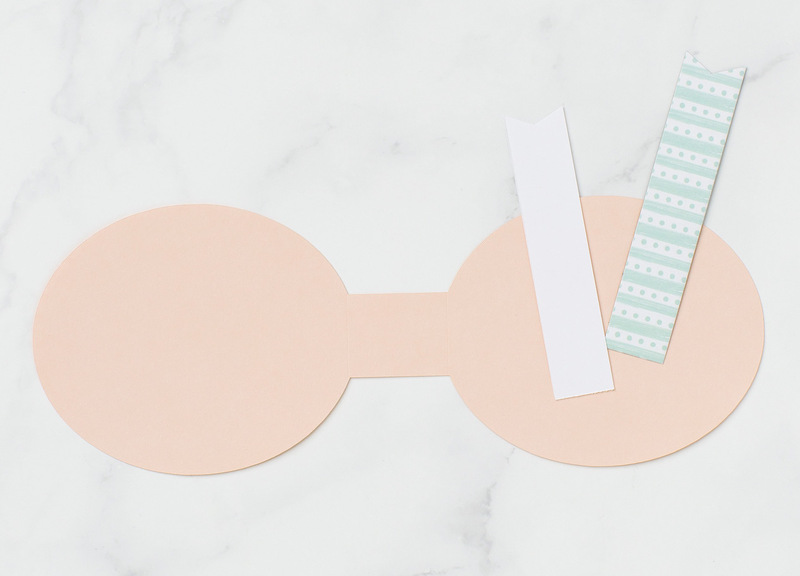 Grouping them together by color makes it easy for you to cut shapes from the same paper. Have you ever wondered what this number means? You might see a number like this one in instructions or recipes we provide for artwork that use Cricut® shapes. This number is the image number in Design Space. When inserting an image on your canvas, you can search for a specific image by entering the entire number in the search box. Make sure to include the “#” symbol when you search. To search for a specific image, click Images on the left side of your canvas. Then enter the image number in the search box in the top right corner, just like we did to find a the banner used in this project. 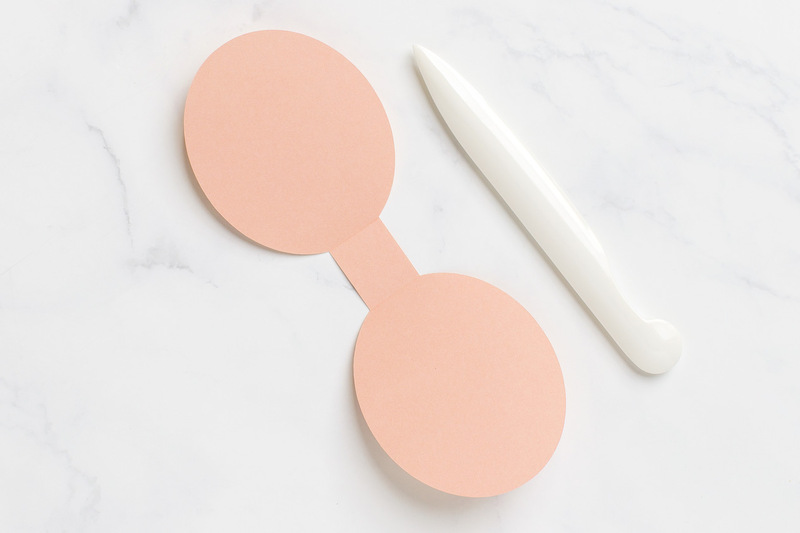 A simple tool you’ll use over and over again is Size. In the Edit bar, you’ll see Size and then the width and height of a selected image. You’ll also notice a lock symbol. When the lock is closed, if you adjust the width of the shape, for example, Design Space will automatically change the height to match the proportions. If you want to change both, simply click on the lock. It will unlock, allowing you to manipulate either one as desired. Some images in Design Space have multiple layers. When you insert the image on the canvas, the layers will be grouped together. To manipulate each one individually, you have to use UnGroup. Simply select the image and click on UnGroup. You can see that this banner image has two layers, one solid base layer and one overlay with the words “DREAM Big.” To make changes to each one individually, we ungrouped the image. Another frequently used tool in Design Space is Duplicate. This lets you make a copy of any shape or shapes you have selected. Just click on the shape and click Duplicate at the top of the Layers panel. The word weld basically means to unite. While it often refers to metals, in Design Space, when you use this tool, you can combine, or “unite,” multiple shapes into one image, removing extra cut lines. Simply arrange the images as desired. Select all of them at the same time and click Weld. Now, instead of many separate images, they will be combined together as one single shape. This is how we created the solid base piece for our title. The title at the top of this page is made using the tools we’ve reviewed today to manipulate one image in Design Space. Follow the steps below to put it all together and make your own! First, search for the image, #M4171A5, and insert it on your canvas. Resize the solid banner to a height of 3″, leaving the width locked. 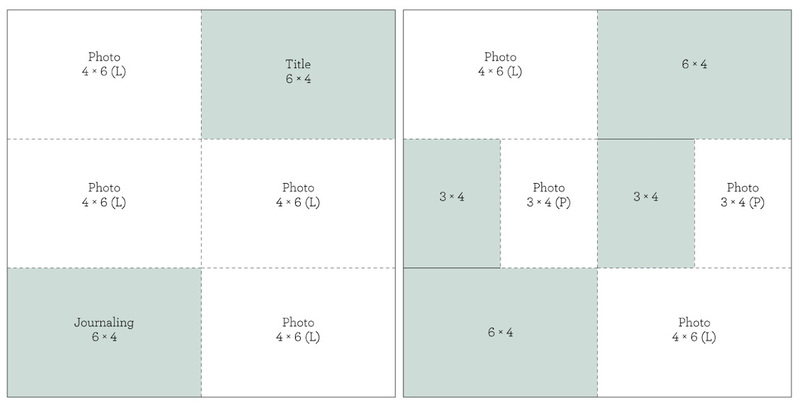 Then, duplicate and resize to have six additional banners, two 2″ and four 1.5″. Arrange the banners like you see on the page with the solid 3″ banner in the center and one 2″ and 1.5″ banner on either side. Click and drag your cursor over all the images to select them all. Then, click Weld. This gives you the solid piece to go behind the remaining banners. We, then, went ahead and colored the additional 2″ banners light yellow, and the additional 1.5″ banners pink. 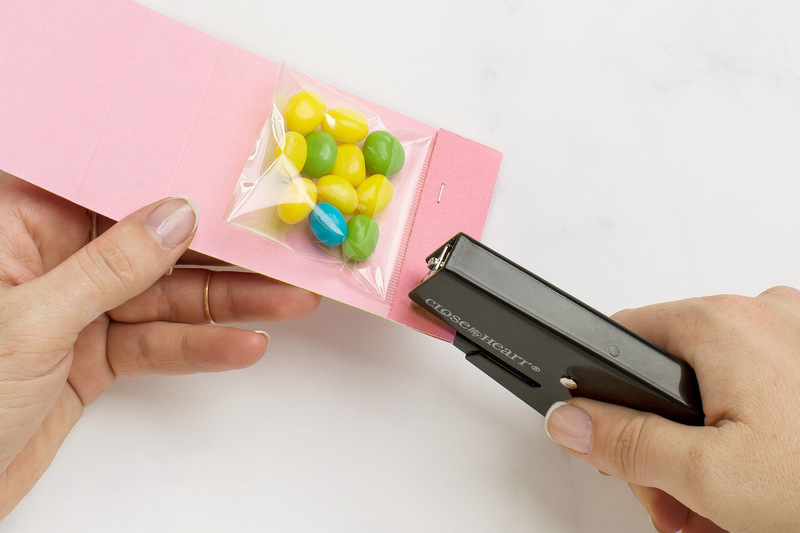 This just helps you cut the right color of paper or cardstock. Select Make It in the top right corner and cut your project pieces. Then, assemble your title like you see on the page. Keep in mind, to use the same image we did, you must own the Artistry Cricut® collection. 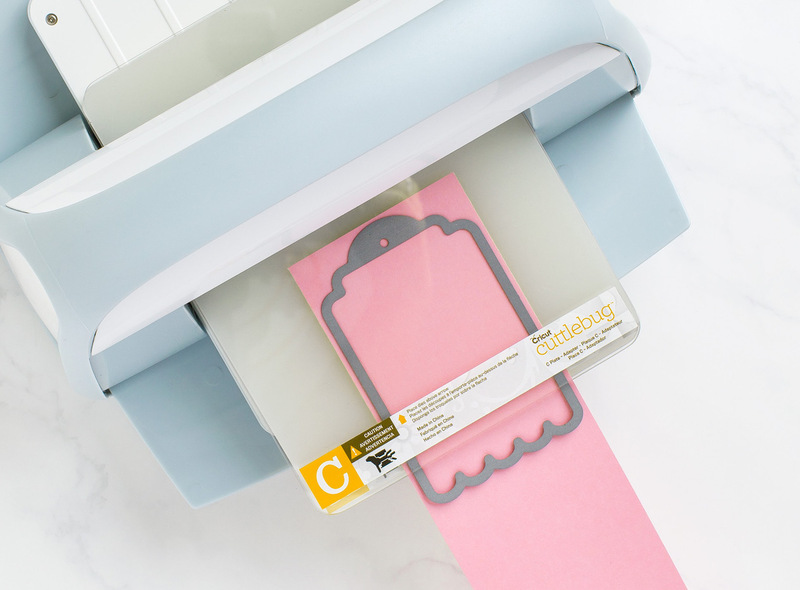 You will also need a Cricut® machine that is Design Space compatible (any of the Explore or the new Maker machines). 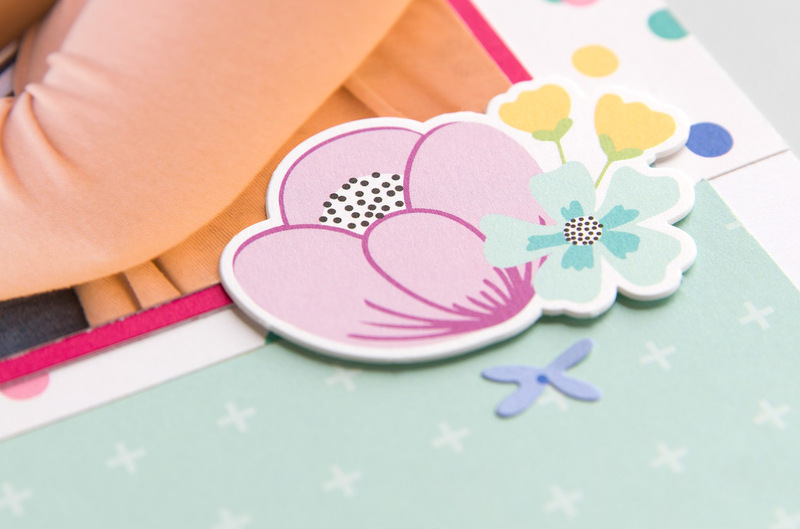 Stay tuned for another back to the basics post next month featuring more Design Space tools with the Flower Market collection to make… cards! It’s been a week since Valentine’s Day. Some of us celebrated with chocolates, flowers, dinners out, or even a sweet new color wheel ( 😉 ). Now what? There’s still some February leftover. 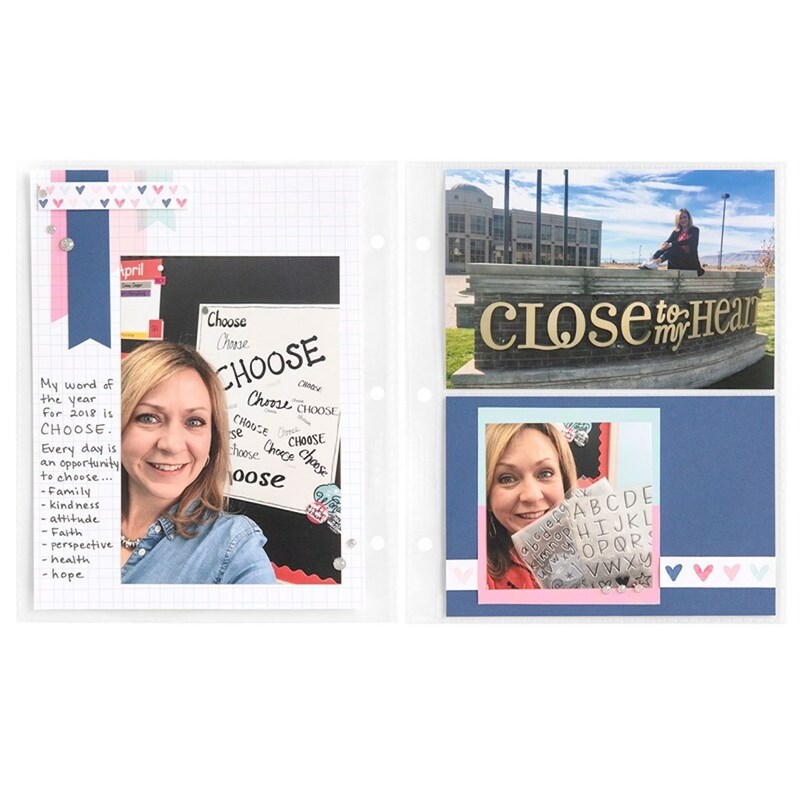 Well, just because it’s no longer Valentine’s Day doesn’t mean we can’t celebrate what everyday life has to offer—that is why we are sharing instructions as a free download to create an Everyday Life™ sized album that does just that! Download your free Heart Happy Everyday Life™ album instructions, here. 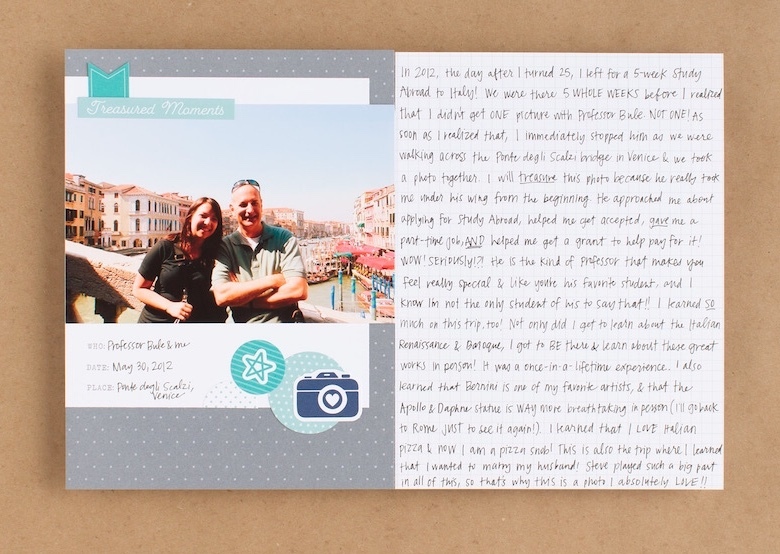 Our message to you today is simple: review the photos that you’ve taken and print them off! Don’t have a place to put them? 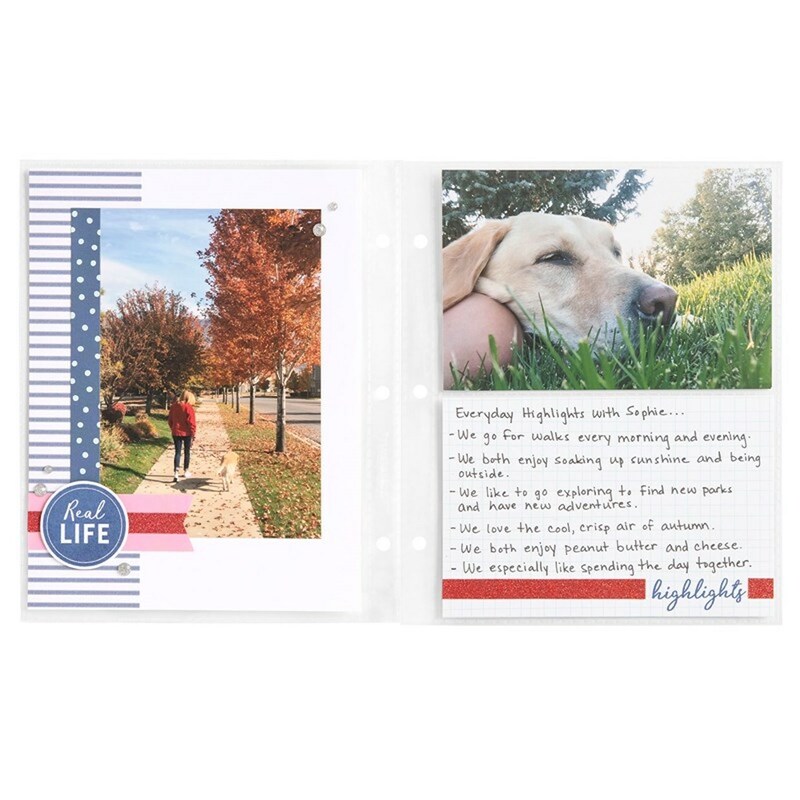 Use the layouts in this Everyday Life™ album to get started and store your photos along with any stories that go with them. Photos evoke emotions, capture moods, and remind us of things we long to hold on to. 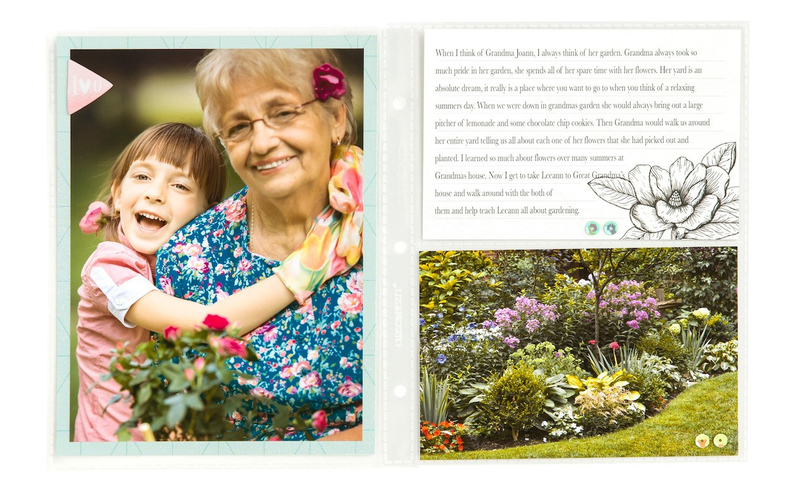 By putting our photos in an album, not only do you get to revisit these feelings, but then we get to share them with others and even allow them to have their own emotional responses. What does that mean? Simply put, it’s important to create albums for your family members and friends to look through. People love seeing pictures of themselves! (You know it’s true!) Children, especially. 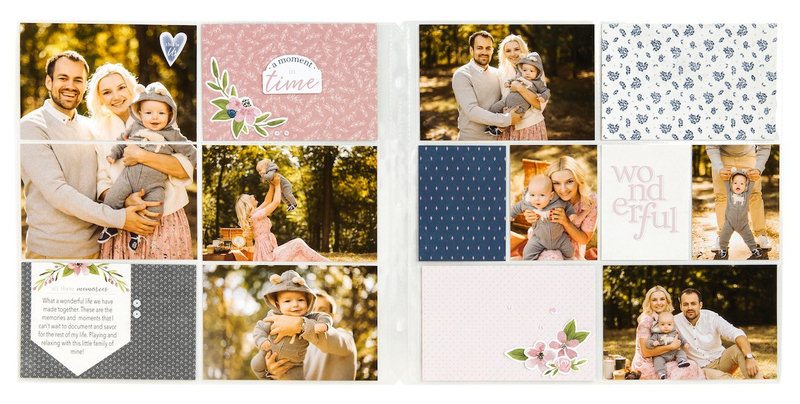 Create a place for the people you love to look at photos that you love, of whatever you love, through beautiful album pages that share your everyday journey. One of the great things about the contents of this kit are the versatile words, icons, and shapes found throughout its stamp set, patterned papers, and stickers. 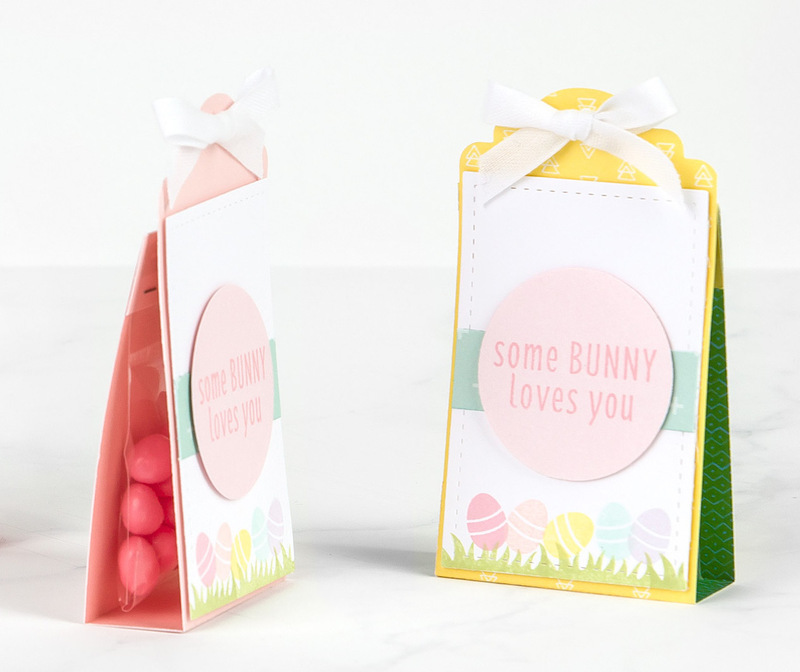 Last month, we showed you these very same products used to create some really fun Valentine’s Day cards (click here to download those card instructions). Above, we showed you an album to showcase the everyday moments. Now, we want to show you even more! We hope today’s post inspires you to do something with all of those memories that you are storing up. 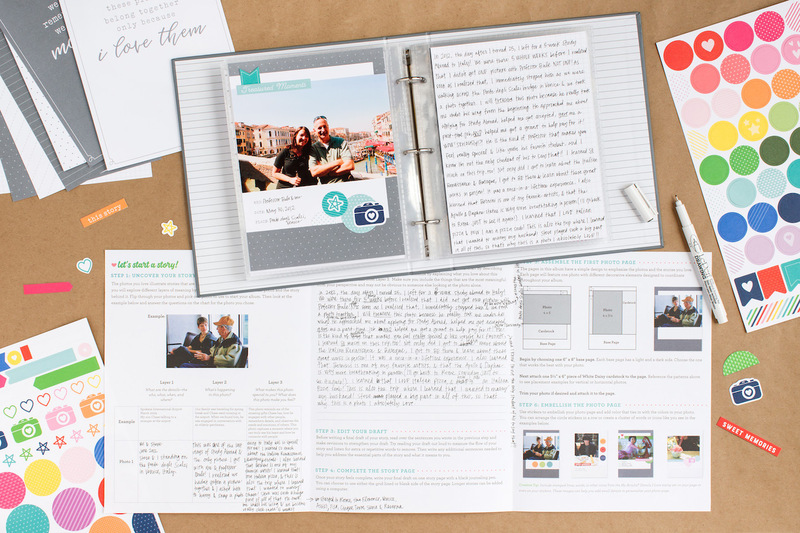 Print your photos, write your stories, and create something with them to celebrate the way life looks today. Take the time to make your heart happy!